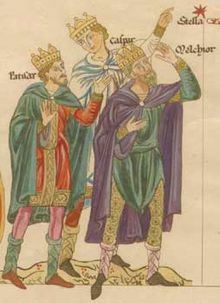 Background: The Magi were a group of three Wise Men (Kings), who travelled from the East to find and worship the Baby Jesus at the time of his birth. They were guided by, “The Star of Bethlehem,” and were accompanied by Shepherds and Angels. They brought with them gifts of gold, frankincense and myrrh. Their joy is celebrated in this Novena. 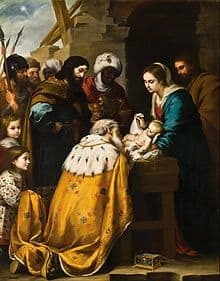 The Epiphany (6th January) is often referred to as the Three King’s Day. O Holy Magi, you were living in continual expectation of the rising of the Star of Jacob, which would announce the birth of the true Son of justice; obtain for me an increase of faith and charity, and the grace to live in continual hope of beholding, one day, the light of heavenly glory and eternal joy. look on me a little child. Heart of Jesus, I adore Thee. Heart of Mary, I implore Thee. Heart of Joseph, pure and just. In these three hearts, I put my trust. ever to lead a pure and blameless life. O Holy Magi, who disregarded the severity of the season and the inconveniences of the journey, so that you might find the new-born Messiah; obtain for me the grace, not to allow myself to be discouraged by any difficulty which may meet me on the road to my salvation. O Holy Magi, who, when deserted by the star in the City of Jerusalem, sought humbly from the rulers of the Church, the place where you might discover the object of your journey; obtain for me the grace to have recourse, in faith and humility, in all my doubts and perplexities to the counsel of my superiors, who hold the place of God on earth. O Holy Magi, who were gladdened by the reappearance of the star which led you to Bethlehem; obtain for me from God, the grace that remaining always faithful to Him in afflictions, I may be consoled in time by His grace, and in eternity by His glory. O Holy Magi, who, entered full of faith into the stable of Bethlehem, prostrated yourselves on the earth, to adore the new-born King of the Jews, though He was surrounded only by signs of poverty and weakness; obtain from the Lord for me a lively faith in the real presence of Jesus in the Blessed Sacrament, the true spirit of poverty, and a Christ-like charity for the poor and suffering. O Holy Magi, who offered to Jesus Christ gold, frankincense and myrrh, thereby recognizing Him to be King, God, and Man; obtain from the Lord for me the grace never to present myself before Him with empty hands; but that I may continually offer to Him the gold of charity, the incense of prayer, and the myrrh of penance. O Holy Magi, who, when warned by an angel not to return to Herod, travelled to your home country by another route; obtain for me from the Lord, the grace that, after having found Him in true repentance, I may avoid all danger of ever losing Him again. O Holy Magi, who were first among the Gentiles called to the knowledge of Jesus Christ, and who persevered in the faith till your deaths; obtain from the Lord for me the grace of living always in conformity to my baptismal vows, ever leading a life of faith and, like you, one day seeing God in His heavenly Kingdom.